You are here: Home / Investments / How to invest for your child? With inflation growing rapidly, how do you plan to secure your child’s future; his education or marriage? 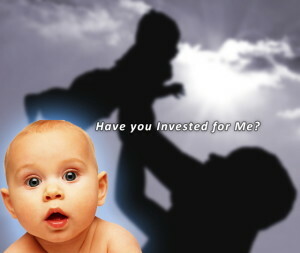 How do you invest for your child and what if, God forbid you are not around for him? Get all these answers here. Having a kid may be the best moment of your lives, and for a lot reasons you always wish to protect him or her from anything that gets in their way. You wish to give them the best of education and a grand wedding, secure their future. So what do you do? Invest for your child, but how and in what? Do you consider inflation and other factors? Do you understand that education costs alone are growing at a disturbingly scary rate of 18-20% every year? Most of you will say invest in FDs, buy Life Insurance policies for them and so on. These are fine but they will not beat inflation. They will give you more money than what you put in today, but will not give you ‘value’ at that time. Inflation will make your returns negative. So what do you do? One thing we must understand is that the way you need money, same will apply for your child. No one will give you discounts for the child except for transport tickets, amusement parks etc. The basic investment logic needs to be the same as it is for your own self. The taxation, returns and risks associated with the investment for your child are the same as they are for any other investment. If you invest for your child, the income on such investments will be clubbed with your income as per IT laws. So once we stop taking the invest for child thing in a different way, we may have a lot of investment options or child plans in India. Children’s investment has similar options as your own. So you have all the Fixed Deposits, Mutual Funds, Life Insurance, PPF, Government Bonds, Equity, Gold etc. You need to diversify and invest in a staged manner; more equity at the start and less towards the end. One thing unique to investment for child is the various Children’s Plans or Child Plan. These are interesting as they are expensive than other options, but offer some features that are worth considering. Firstly, set goals. Why you wan to invest? Education or Marriage or Future or all? When will you need the funds at your disposal? Jot down these points and then proceed. Typically people invest for a tenure of anywhere between 10-12 years for their children. This is because, mostly people will not realize that they should invest as soon as their child is born and not after he/she is going to school. Some even start later than that. This makes you loose the compounded returns. Start EARLY, ideally from his first year itself. It will also give more time for your money to grow and you will need to put in less money every month if your time line is between 15-25 years. Go anywhere in the world, you will get one common statement for investments – ‘Equity investments will give you the best returns in all the investment class, IF you invest for a long term’. Start an SIP in your child’s name with you being the guardian. Choose the growth option or dividend reinvestment option and keep the tenure for 10 years. Even if you invest 1,000 per month your corpus at the end of tenure will be very decent and definitely more than what a 10 year FD would give you on the same amount. You can even opt for multiple SIP in various funds including ELSS, as these are tax savers, the amount invested is tax free. You can refer our guide to understand mutual funds here and how to invest in them here. The reasoning behind the mutual fund route is that since you invest for your child’s future, it is safe to assume the horizon you are looking at is 15 years minimum, as this is the time when you will need a fist chunk of cash for his/her higher studies. If the tenure of Mutual Fund SIP is 7 to 10 years, at the end of 10 years, you can start putting this money in FDs or Debt Funds. This is because the inflation will not affect you so much in the next 4-5 years as it would have affected you in the entire 15 year time frame. Also your first goal is near, so you do not want to risk the corpus now. The markets can be volatile and now your duration is shorter, so to be on a safer side, you should after the 10 year period, invest the same in some Balanced or Debt fund and traditional FD. This way your money has grown and now you are consolidating the amount and securing it. Same way, if you plan for his/her marriage costs, it is safe to assume that on an average going by today’s standards you may not need that money till about the next 23-25 years. Same approach can be adopted here. Once the SIP tenure is over you can shift to some Balanced mutual fund but keep some part still in equity for another 4-5 years. Then after a period of about 15 years, you can consolidate this amount and shift to the safer avenues of FD and Debt Funds or Government Bonds etc. In all above scenarios, make sure to be well aware of the lock-in periods of these funds, especially the ELSS ones. Usually there can be a lock-in period of 3-5 years and you do not want to be in a situation where you realize that you need the funds, but you cannot withdraw them immediately. If you feel you may need some periodic funds during his schooling days, you can even start a Recurring Deposit account that matures yearly. This needs to be updated every year and on maturity you will have a yearly sum for his ongoing schooling. By all means you can even buy some shares in your name just as an investment that you can transfer to his/her name when he/she is an adult. Gold will beat inflation as its prices directly correspond to the inflation. Yes, today gold is expensive, agreed. But what was 10 gm Gold worth just 3-4 years back? See the difference. Add Gold to your Child Plan portfolio. You do not need to buy a huge chunk of gold at a stretch. You have a long time for it. Invest in gold but systematically. You can opt for Gold ETF or e-Gold and invest one fixed amount every month. You can start an SIP in gold ETF. This way you need not worry about the pricing and making charges or safety issues that affect the physical gold purchases. You can also keep buying 1 gm gold coins, however do keep the bills handy to avid any tax issues and get a locker with a good bank for its safety. Follow this habit for the next 10-15 years and you will have enough gold your child’s wedding or even more for their future. Get yourself a term plan if you do not already have. Do it now. Term plan will have less premium and more sum assured. If anything were to happen to you, your family will be financially secured at least, and child is part of that family too. This one is a bit tricky. A lot of experts say that child plans are expensive and that regular mutual funds and term plan can cover a lot of things that child plans offer. While this is true, but there is also one school of thought that says that child plans are essential. Here’s the logic. Child Plans in India comes with slightly higher administrative costs. So if you invest 1000 in a mutual fund chances are around 975-980 will be invested and only 20-25 Rs. will go towards admin charges. This is higher in child plans and also the sum assured is lesser when compared to a pure term plan. Having said the above, one should also consider the features in a child plan that will provide life cover for you as well as still continue to invest in the plan until maturity. Child Plans have this option. If something were to happen to you, your nominee will get sum assured but at the same time, future premiums towards the child plan will be waived off, and yet the company keeps investing the same amount to your existing child plan just as you would have done. This continued investment would have stopped in case of a mutual fund or any other investment in your absence. Other benefit is staged payments. You can opt for certain sum of money maturing and being available at various stages in the investment cycle of your child plan. Like say when your child is in the 10th or 12th grade, you wont need entire sum for his/her higher education, but growing tuition fees and various classes we send our kids to these days will certainly require some additional funds. You can make such provisions in the child plan. You need to balance between the costs and the benefits and you can always opt for both. Invest a part in Mutual Funds and ETFs and part in Child Plan. The tenure is longer so you can take a lower plan with top up facility so that you can increase your investment with increasing income. PAN card is mandatory in a lot of financial transactions now-a-days and with KYC norms coming in place every mutual fund investment will require PAN. Also having a PAN, it will be much simpler to open bank accounts and make other investments for your child. PPF automatically removes the dilemma of tenure and taxation both. By default PPF has a lock-in period of 15 years, so your first goal will be almost that far away in the first place anyway. As you know, you may invest a minimum of 500 and a maximum of 1,00,000 in a given financial year in the PPF account. This way any lump sum cash or payments you or your child receives, say from social functions, gifts etc, can be deposited in PPF. The amount invested as well as the interest earned in PPF is tax free. Since your child will be a minor for most part or entirety of the PPF account’s lock-in tenure, you as a guardian will make the payments on his behalf. You are entitled to tax benefits for the same deposits you make in your child’s PPF account. However, if you too have a PPF account, you can only deposit 1,00,000 in total for your as well as your kid’s account combined. So keep that in mind. Well, if you invest in your child’s name in schemes that involve life insurance, like Child Plans etc, these payments are tax-free. Also PPF deposits are tax-free and so are ELSS investments. However if your child earns from the FDs or Mutual Funds in terms of interest etc, this will be clubbed with your income. In this case you are entitled to Rs. 1500 tax exemption per year. However, if your child earns by his own means (he may work in ad films or win some contest or sell his paintings or whatever), this income will not be termed yours and you do not pay tax on it. As parents the way we lived and the difficulties we faced, we would surely want to negate those for our little ones. Investing early for your child will help you build a corpus for him/her that will be more than useful when the time comes and you as parents will be smiling all the way. Thanks for the encouraging kind words.